We try t get the post from our old site over in chronological order, however the new system will only consider the date it's publish. We will add the original date of publication at the end of of any post transferred. Sorry for any confusion this may creates. May the melody and spirit of the holidays fill your home with love and peace. 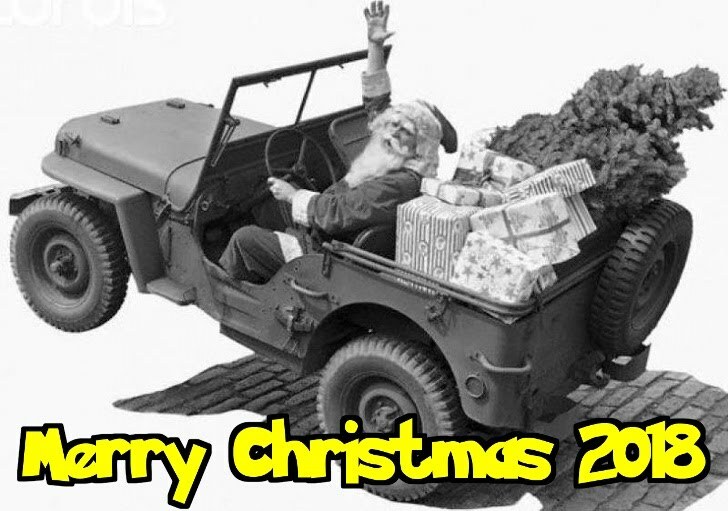 We wish you all the best and happy New Year too! Traffic jam in the sky. On a flight to La Paz, Mexico for the Christmas holidays, I watched an about five-year-old boy sitting next to his mom staring intently out the airplane window. We had just taken off and were passing through some big white clouds. He looked concerned and I wondered what he might be thinking about. Mitjet technical specification sheet reads like a lot of fun and the price appears to be right as well. There is very little info to find at the moment and most of it in french. It's enough to introduce the vehicle and the video do show some of the cars capabilities. 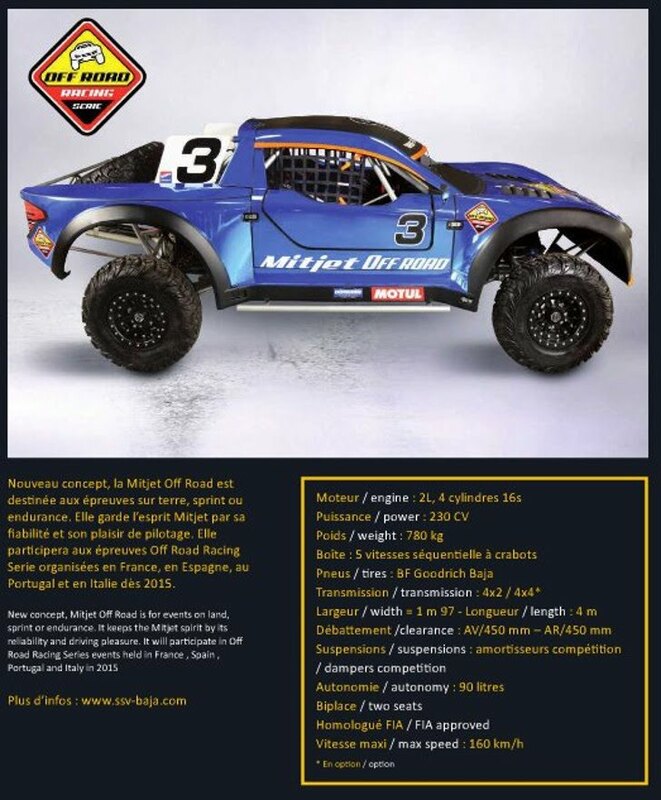 The specs are from the www.ssv-baja.com website which gives a 3.5 litre V6 as engine while in the Mitjet Mag an advertisement shows a engine choice of 2.0l 4 cylinder 16valve with 230 hp and 780kg (1720lbs) weight. Additional is the option of 4x2 and 4x4 given. Options: LED bar, spare wheel, Terratrip, Kit strap and shackle. China Silk Road Rally 2015, the revised 13-day cross-country rally raid that starts in Xi’an on 30. August 2015 and finishes in Dunhuang on 11. September 2015. The event is being organized by the China Silk Road Rally Auto Sports Management Company Limited, in association with CCTV Sports and Entertainment Company Ltd. and the Beijing Motorsports Development Company, with the full cooperation of the Federation of Automobile Sports of China (FASC) and the support of the sporting bureau of several Chinese regions. Scrutineering and administration took place inside the park of the Legend of the Tang Empire in Xi’an on August 26th and 27th. Sixty-five cars and trucks and 16 motorcycles safely completed their administration checks inside the park of the Legend of the Tang Empire in Xi’an and Team Peugeot Total driver Stéphane Peterhansel leads the international field into 13 days of action across some of the remotest terrain in central China and Inner Mongolia. 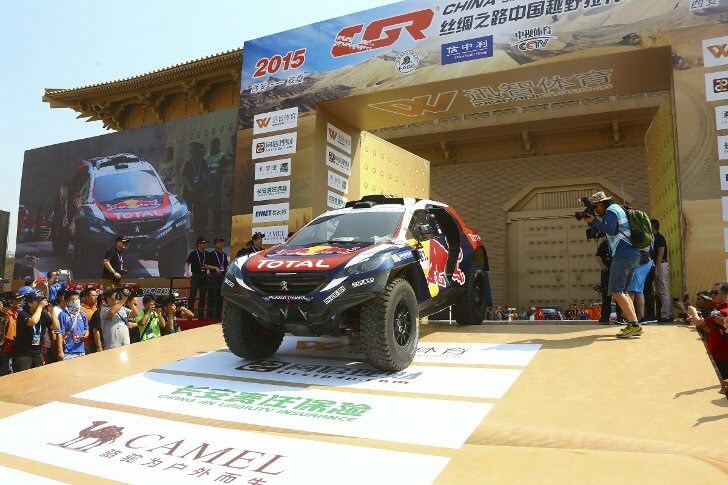 At the midway point of the Silk Road Rally Raid 2015 the two Peugeot 2008 DKRs running first and second. It was business as usual at the front of the car race, with Team Peugeot Total’s Stéphane Peterhansel and Jean-Paul Cotttet extending their lead over Cyril Despres and David Castera to 22min 03sec with another fastest time. Despres clocked the second quickest time and his hold on second place was strengthened still further when Haval rival Han Wei sustained a flat tire after 105km and dropped several minutes. In the motorcycle category Jincheng rider Su Wen Min capitalized on a navigational error by Spaniard Armand Monleòn Hernandez to secure the fastest time in the motorcycle category on the seventh selective section of the China Silk Road Rally around Alxa Youqi in Inner Mongolia on Saturday. However, Red Bull KTM 450 Rally rider Monleòn retains a comfortable lead of 18min 43sec in the overall standings with six stages remaining. Zhao Hong Yei climbed to third overall on his KTM 450 Rally after the third fastest time was sufficient for him to overtake Zhou Tien (Jincheng) in the overall standings. Red Bull Romaniacs Hard Enduro Rallye" in the Carpathians Mountain areas in Romania organized by Martin Freinademetz, former multiple World & European snowboard champion. With ten years of experience, the track management team of the Red Bull Romaniacs was facing their ultimate challenge during the preparation of the 11th edition: Adding a completely new class to the existing lineup of three classes meant adjusting 600km of trails to the profile of the new “Iron-Class” (profile = rideable). Here is what they came up with: The Red Bull Romaniacs is a five-day Extreme Enduro race, that kicks off with an inner city prologue, followed by four extremely demanding offroad days through the Southern Carpathian wilderness. In 2014, Offroad-Day Two will be the most challenging one: with a very high frequency of uninviting sections for all classes and extremely steep profiles. In 2010, we considered the area still “unrideable”. Offroad Day Three will be almost as gnarly but it makes up for it with a great mix of landscapes, flowy trails and the biggest altitude deltas. It is track-director Klaus Sorensen`s favorite. Founder Martin Freinademetz however prefers Offroad Day Four for it`s high paced rallye-style, the beautiful passages through high-mountain areas and the special surprises at the end (overall finish). Offroad Day Four will be the toughest one for the Iron Class and will bring all classes to their limits. Which leaves Offroad Day One as the day that gently eases competitors into race-mode. At least more gentle than Offroad Day One 2013! Fly-baby" - a nice surprise for the 2014 Red Bull Romaniacs Gold-class! A steep uphill with a beautiful step-up, here tested by track director Klaus Sorensen and track manager Radu Zicu. Racing accident claims life of American desert racing star Kurt Caselli. SCORE International confirms tragic racing accident claims life of American desert racing star Kurt Caselli. SCORE International, a desert racing sanctioning body based in Reno, Nev., has confirmed that American motorcycle star Kurt Caselli tragically lost his life Friday as a result of injuries sustained during a late-race accident at the SCORE Baja 1000 being held in Mexico’s Baja California. One of the best-liked and respected personalities in American desert racing, Caselli, 30, of Palmdale, Calif., died of serious trauma incurred when he apparently lost control of his KTM motorcycle in a sandy, high-speed section at approximate race-mile 792 while his team was leading in the late stages of the 883.1-mile international desert race. The accident occurred at 4:30 p.m. PT Friday. "Our desert racing family has lost a very special person in Kurt," commented SCORE President Roger Norman. "Kurt was a superb racer and this is a tragedy that affects us all. We extend our deepest condolences, thoughts and prayers to the Caselli family. Their loss is immeasurable and we grieve with them." A multi-time AMA National Hare & Hound Champion, WORCS Champion and many-time ISDE gold medalist, Caselli was a developing international rally racer as well. In June of this year he won the Desafio Ruta 40 Rally in Argentina – in what was only his second international rally since making his debut in the Dakar Rally at the end of 2012. Caselli won two stages of the Dakar Rally this past January. Cabo 250 with severe accident involving 2 Class 9 racer which apparently could not manage a right-turn in safe speed. The vehicle plowed into the spectators crowd injuring a 16 year old life-threatening. He suffered severe head trauma and other injuries. Additional 2 other bystanders got hurt yet with lesser injuries. 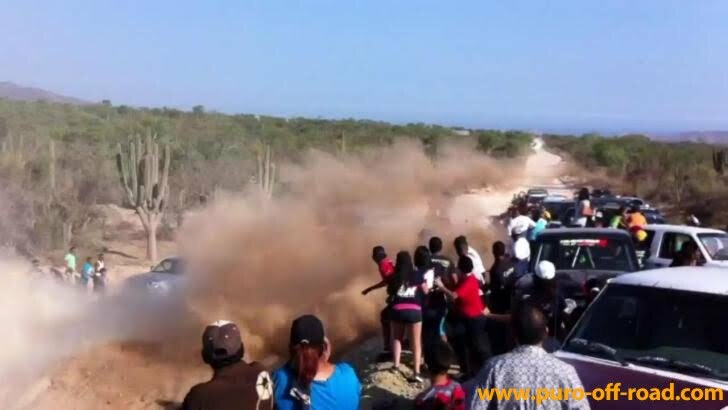 The driver of the race-car, Rafael Montaño, also got submitted to the hospital in Cabo San Lucas with injuries. As you can see in video did Montaño not slow down much and tried to force the vehicle into the right-turn. Was there a mechanical failure or did Montaño run out of driving talent?? After hitting the spectator group it appears the vehicle got launched of the banking - looks like even OVER parked cars - at the area way past the initial impact. However, if you watch closely you can see the incident involves 2 Class 9 racers - the second one was the vehicle launched over the banking. If the second car hit any spectators is so far unknown. Jump into the passenger seat this season in Drivin' Dirty with professional off-road racer, Bryce Menzies. Bryce and his crew kick it into gear and rally their way through off-roading and the X-Games. Buckle your seat belts, the competition might get dirty. And since it is about American racer Bryce Menzies a few words about his X Games Munich Rallycross experience where he drove his 550bhp Dodge Dart. Having joined forces with Travis Pastrana’s rallycross team Pastrana Racing, Menzies now juggles a career in the Global Rallycross championship with his other love, off-road racing in the US-based TORC series and in desert races. The last two X Games have been difficult for Menzies – he failed to make the final in Brazil and then rain cancelled the whole event in Barcelona. Munich was not much better for Bryce. Drivers from Formula One, NASCAR, IndyCar: They all want in on the fun. They hear Travis Pastrana at Nationwide Series races gushing about the fun he has sliding his Dodge in the dirt. They see the increased popularity drivers such as Tanner Foust and Ken Block are experiencing now that the series has truly gone global. They watched former F1 and NASCAR driver Scott Speed win the X Games in Foz do Iguaçu in April. And now they all want a chance to be the next rookie champ. At the LCQ when the race restarted, it was New Zealander Millen who took a dominant win ahead of ex-F1 racer Scott Speed, as Pastrana’s team-mate Bryce Menzies retired after clipping the wall trying to move past Speed into second on lap four. That was the end in Munich for Bryce Menzies. Many expected something special from nine-time WRC champion Sebastien Loeb as he took part in the 91st running of the Pikes Peak International Hill Climb yesterday (30 June), but not many predicted him to completely obliterate the record. The Frenchman clocked an incredible time of 8m13.878s, becoming the first driver ever to do a sub nine-minute time and beating the previous Pikes Peak record by over a minute and a half. When the race cars and motorcycles leave the starting line for Sunday’s 91st Pikes Peak International Hill Climb, it will mark only the second time in the race’s history that the entire 12.42-mile, 156-turn course will be fully paved. And although by all accounts this will be an epic year (with more cars expected to break the 10-minute barrier), there are many traditionalists who wish the course were still all dirt. The “dirt” that the cars used to race on was a decomposed granite surface that suited the hang-it-out style of driving favored by American dirt-track legends like the Unsers and later by rally stars such as Ari Vatanen, Walter Rörhl and Rod Millen. Do today’s drivers wish the course were still gravel? While we suspect nine-time World Rally Champion Sébastien Loeb, fast qualifier on Thursday, would dominate on any surface (and express no particular preference for one over the other), we had a chance to speak with four Pikes Peak veterans who had lots to say on the subject. “I’ve raced on both, but I love the dirt. That was classic Pikes Peak. I think of the cool cars that ran up here back then, listening to them trying to get traction. Sometimes you could see the dust trail before you actually saw the car. That was spectacular! “While I respect the discipline needed to race on pavement, I really enjoy the amount of effort that had to be put into driving in the dirt. There’s an extra level of driver effort and commitment in the dirt. There’s also a commitment to run on the pavement, no two ways about it. But it’s a different commitment. “I’m a road racer, but I prefer the dirt because it was unique and fun. Almost like a road race in the rain. You had a softer car. I was always a good road racer in the rain, and that’s maybe why I took to Pikes Peak so well. Everybody seems to like the dirt better if we had a choice. But that’s out of our control. “When the course was all dirt, they treated the road properly [with a dust suppressant] that almost made it like concrete. A blue groove [racing line] formed and it was fun to drive. But when they paved the course, they didn’t do it continuously from one section. They paved the bottom, then they paved a part in the middle. Then they paved at the top. So there was a year in which the course went pavement, dirt, pavement, dirt, pavement. And they stopped treating the dirt parts of it, which got so loose and slippery that a groove never formed. You could never find a tire that worked everywhere. I was one of the first drivers who went to a road racing rain tire, which worked pretty well. “I don’t like it as much now. The thrill of driving the road is there, but the thrill of the car control and driving the car on the road is different, gone. You used to be able to hook a wheel on the inside edge of a turn, or have a wheel drop off the cliff edge. It required more commitment at greater slip angles to carry speed on that road. You really needed to know the road to carry all that speed. Watch the award winning short film "Climb Dance" documenting Ari Vatanen's record-breaking run at the 1988 annual Pike's Peak Hill Climb Event in Colorado. The film was created by Jean Louis Mourey and captures Vatanen climbing Pike's Peak in a four wheel drive, four wheel steering Peugeot 405 T16. Failure to comply with the rules stated in this pre-running bulletin will result in a time penalty or disqualification, depending on the circumstances. Please follow the pre-running schedule carefully! Mexican liability insurance and governmental permits are in effect for pre-running only during the dates and locations indicated. Pre-running is not racing!!! Pre-running is the opportunity to preview the race course while at the same time exercising a high degree of caution and proceeding at a safe, reasonable and controlled speed. Be advised that all roads on the race course are open to local traffic during pre-running. Unsafe pre-running is not only dangerous, but is also very disrespectful to the local citizens. 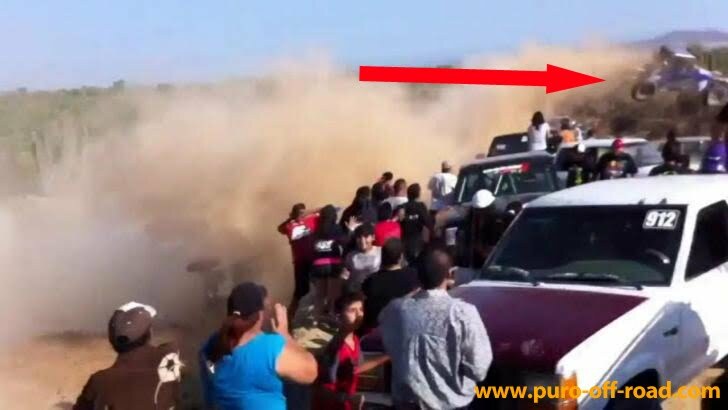 Pre-running in an unsafe manner will subject the driver to legal jeopardy with the mexican police. It will also subject the team to a race penalty. Think wisely first, rather than regretting your unsafe actions later. Use good judgement while pre-running. Pre-running dates and information: The race course will be marked and open to pre-run on Wednesday, 15. May 2013. Begin pre-running in Ojos Negros at the Hwy3@km39 junction. End pre-running west of Ojos Negros and exit the race course across open field to Hwy3@km36. Do not attempt to pre-run anywhere between Ensenada and Ojos Negros at this time. Outbound pre-running is permitted from the Ensenada start line to Ojos Negros Hwy3@km39 only on Thursday, 30. May 2013 and Friday, 31. May 2013. To avoid dangerous two-way traffic: Absolutely no inbound pre-running from west of Ojos Negros Hwy3@km36 back to the Ensenada finish line. Follow exit markings at the end of pre-run area to exit the course across open field to Hwy3@km36. Failure to comply with the pre-running rules stated in this bulletin will result in a time penalty or disqualification, depending on the circumstances. "For the first time in SCORE Baja racing history, qualifying for starting positions will be held. 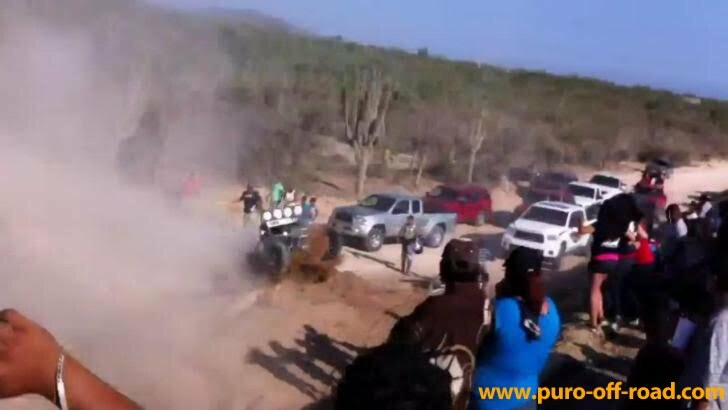 On Thursday, May 30, qualifying for both the SCORE Trophy Truck and the unlimited Class 1 will be held over a special course near Ensenada. A total of 36 SCORE Trophy Trucks and 20 Class 1 entries will qualify for their starting positions on Thursday, 30. May 2013. Marking the first time there has been qualifying in the storied history of SCORE Baja racing." is stated in SCORE news release from 24. April 2013. Hold your horses and dont get excited!! About 2 weeks before the race is the (by us unconfirmed - original source: Gabriel García, El Vigía/13.05.2013/20:08) statement at several social media streams that Roger Norman announced: "Qualifying course will be closed to spectators"! What's gonna be next?? For security reasons we are only allowed to consume Tecate beer at pre-determined prices at SCORE sanctioned tiendas? Who ever brings Pacifico or Corona is excluded from spectating the event?? Starting Order updated 4/23/2013. 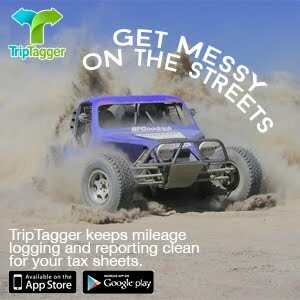 45th Annual Tecate SCORE Baja 500 May 30-June 2, 2013—Ensenada, Baja California, Mexico. Total Entries in the start draw: 169 (as of 4/23/13). Following Tuesday’s night live drawing for starting positions, Southern California desert racing ace Robby Bell, the defending overall winner, will be the first motorcycle off the starting line in the upcoming 45th annual Tecate SCORE Baja 500 desert race. Entries from around the world continue to arrive for Round 2 of the 2013 SCORE Desert Series, to be held May 30-June 2 in Mexico’s Baja California Norte, starting and finishing in Ensenada, the seaside port on the Pacific Ocean, 80 miles south of San Diego. With SCORE Trophy Trucks and unlimited Class 1 open-wheel desert race cars qualifying for starting positions, Bell is certain of his starting position on, Saturday, June 1. The start draw was broadcast live worldwide during a special edition of Roger Norman’s Internet show. For the first time in SCORE Baja racing history, qualifying for starting positions will be held. On Thursday, May 30, qualifying for both the SCORE Trophy Truck and the unlimited Class 1 will be held over a special course near Ensenada. A total of 36 SCORE Trophy Trucks and 20 Class 1 entries will qualify for their starting positions on Thursday (May 30), marking the first time there has been qualifying in the storied history of SCORE Baja racing. For the top two car and truck classes, their drawing identified their qualifying order in each class. Drawing the first qualifying positions in their respective classes were B.J. Baldwin, Las Vegas, in the No. 1 Monster Energy Baldwin Motorsports Chevy Silverado SCORE Trophy Truck and Eduardo Laguna, Mexicali, Mexico, who drives the No. 117 Speed Energy RPM Racing RGM-Chevy open-wheel race car. Content / Entry List credits: SCORE Intl.